Tropical forest environments apparently provided the cradle for the emergence of early hominins in Africa as well as a habitat for the continued survival of our closest living relatives, the great apes.However, while the important early role of tropical forests in human evolution has been recognized, forest adaptations tend to be eclipsed in later evolutionary narratives, including the emergence of the genus Homo and the expansion of Homo species across the globe. In a new paper in Evolutionary Anthropology, researchers from the Max Planck Institute for the Science of Human History review the evidence for the time-depth and nature of Homo’s relationship with tropical forest environments. They conclude that it is only with the emergence of our species, Homo sapiens, that a Homo species can definitively be seen engaging, and even specializing, in the use of tropical forests at an ever-intensifying rate. Tropical forests constitute some of the most diverse, complex, but also threatened, terrestrial ecosystems on the planet. They provide crucial ecosystem services (e.g. foods, construction materials, and medicinal resources) for vast portions of the world’s human population. However, the ability of hominin foragers to adapt to these environments in the past has been questioned, with limited carbohydrate resources, few large game opportunities, and difficulties of thermoregulation being cited as important limiting factors. This is despite the fact that these environments produce easy access to plentiful freshwater. In addition, some of the earliest fossils of the genus Homo come from modern tropical forest environments in Southeast Asia and many of our ancestors appear to have retained body features that can be linked to tropical forest habitats. 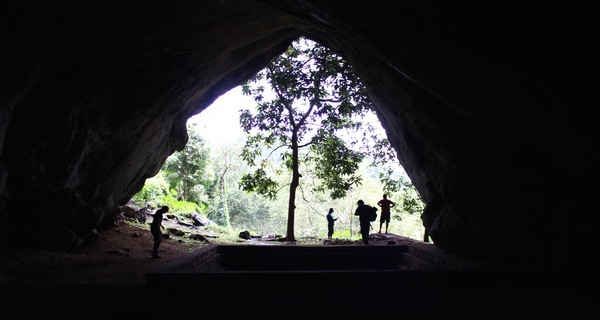 Dr. Patrick Roberts, Prof. Nicole Boivin, and Prof. Michael Petraglia, alongside international collaborators, reviewed the palaeoenvironmental and archaeological evidence for the use and occupation of tropical forests by different species of Homo. It was found that early Homo in Africa and Homo erectus and Homo floresiensis in Southeast Asia currently show no direct evidence for having interacted significantly with tropical forest resources. By contrast, our species, Homo sapiens, shows early and ever-intensifying specialized adaptations to tropical forests around the world. While this could be a result of preservation biases, it currently seems most likely that it is part of a real, unique adaptive flexibility and plasticity that enabled our species to rapidly colonise and persist across the huge variety of the Earth’s environments.